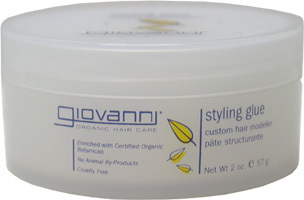 Spike your tips, slick your sides, or do anything you want to with your hair when you use Giovanni’s Styling Glue. Tailor your hair to your specific needs and keep it where you want it all day long! 2 oz. jar is $7.69. From Kristy T of Chicago, Illinois on 1/27/2017 . I searched everywhere for a vegan hair paste that would keep my style hold throughout the day. This stuff delivers!! You can rely on this product! Feels like a paste and keeps your shape in check. From Veganman of Brawley, California on 6/8/2011 . I love the fragrance of this product. Keeps short hair fixed in the manner in which you put it on. I have purchased this product several times. Good stuff! From Anonymous of oxnard, California on 7/29/2009 . From Anonymous of Salisbury, Maryland on 7/16/2009 . It's the only product I've found (vegan or not) that holds my hair without it looking greasy. Has anyone tried it as brow wax?